In WFP applications drag and drop functionality is provided by subscribing several events. First of all you need LeftMouseButtonClick and MouseMove events in order to start Drag and Drop. As we can see from the code above, first with LeftMouseButtonClick event, we captured the starting point, then by MouseMove event, calculated distance between starting point and the current mouse position. If the distance is big enough we start DragDrop. When the Drag starts it is necessary to prepare Drag functionality by providing the object to be dragged. In our case (code sample above) we are going to drag TextBox. In order to drag TextBox first we create DragData object by specifying TextBox object in the Constructor, and call DragDrop static method by passing objects we mentioned. Beside preparing data to be dragged, we need to subscribe to QueryContinueDrag event in order to track dragging status. This is all we need to prepare Drag and Drop in our application. If we want to drag object out of WPF aplication, we have no enough information to accomplish drop. As soon as the mouse is outside the app, mousemove event is not firing any more. One of the solution of the problem could be capturing the mouse move position outside the WFP application, and when the left mouse button is up, start with dropping item functionality. 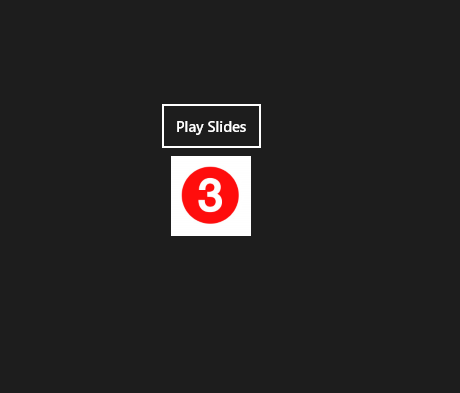 In order to track mouse position outside the WPF application we need to hook and subscribe to the messages of whole Windows OS and filter only we are interesting in. Great blog post about how to capture mouse messages regardless of the mouse position can be found here. Implementation of Low Level Mouse Hook in C# blog post can be modified quickly in order to adopt to our case. First we need a property to indicate when the mouse is outside the application. Then we need to modify HookCallback method so that when the Left mouse button is up, and set the property (IsMouseOutsideApp ) to true if the mouse outside the application. 1. check the keystate value None – this is the case when the mouse is released. 3. show the message text based on the result of drag and dropping. 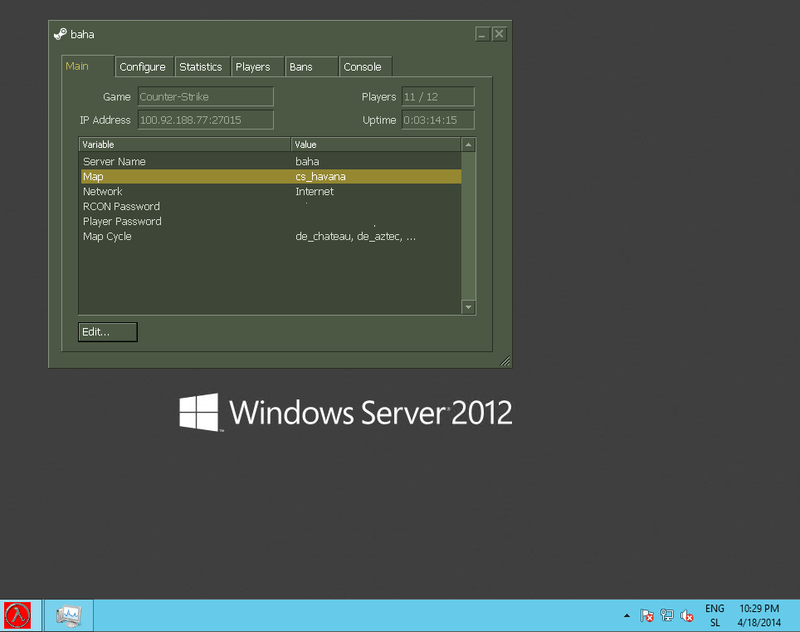 To setup Counter Strike Dedicated Server on Virtual Machine running on Windows Azure you have to perform 10 steps. This blog post is going to explain all them in detail. 1. First thing you should grab is Windows Azure Account. If you dont have one, you can create trial. More information about creating Windows Azure Account you can find on Windows Azure Portal. 2. 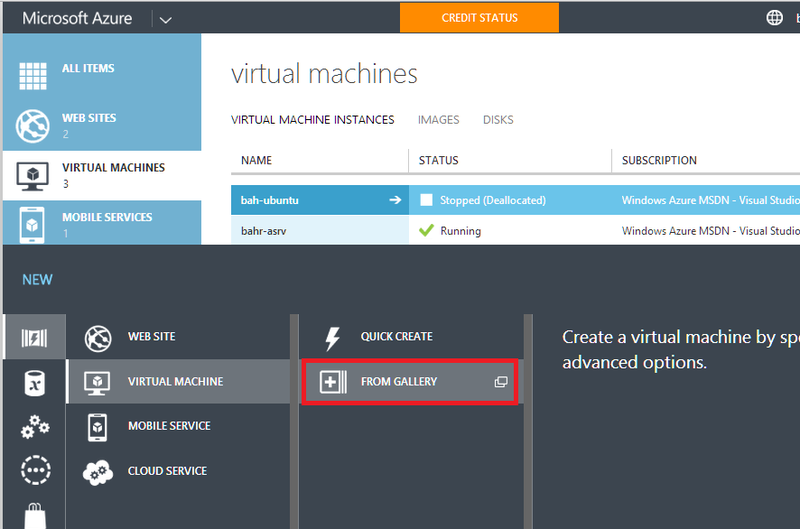 Create Virtual Machine on Windows Azure. Choose New From Bottom Bar and Choose: Compute->Virtual Machine-From Gallery (see pic below). 3. From List of Virtual Machine Select Windows Server 2012. 4. Setup Name of VM, default username and password, and follow instructions. 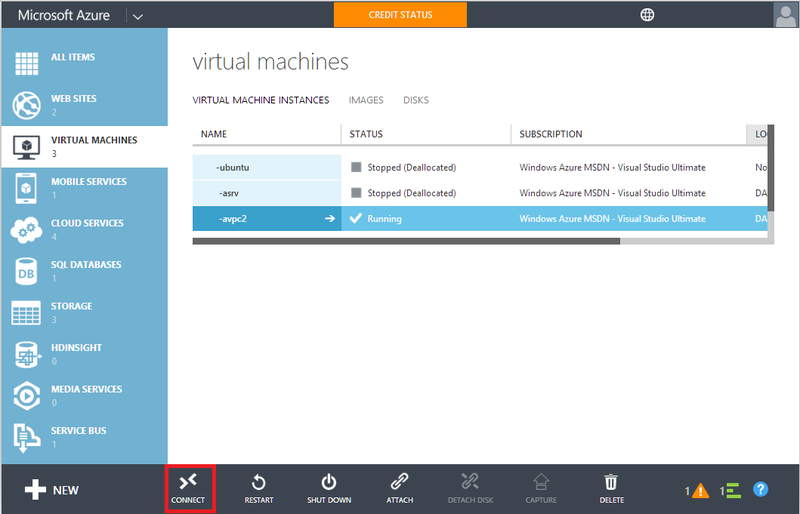 After you finish with VM, by clicking Finish button, Windows Azure will create your VM in few minutes. 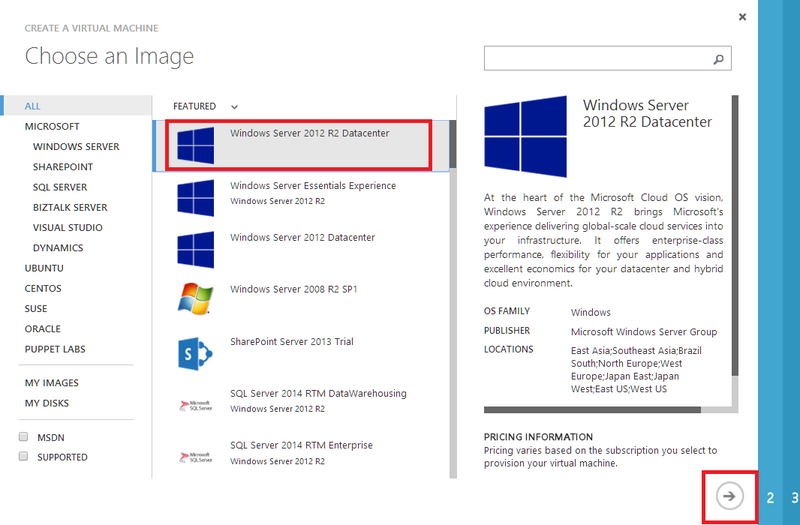 If you need more information how to setup VM on Windows AZure please follow instruction on this link. 5. Download RDP Connection from Windows Azure Portal and connect to you Machine (See picture below). 6. Open your Windows Server VM and Install Counter Strike. After installation go to Counter Strike Folder and Run hlds.exe to cretae Dedicated Server. Fill the fields with the required information and choose Start Server. Now your dedicated server is running but no one can access it yet. We need to open default UDP port 27015 on Windows Firewall, as well as create endpoint on Windows Azure Portal. 7. Open Windows Firewall and Create Incoming and Outcoming Rule for UDP Port= 27015. 8. 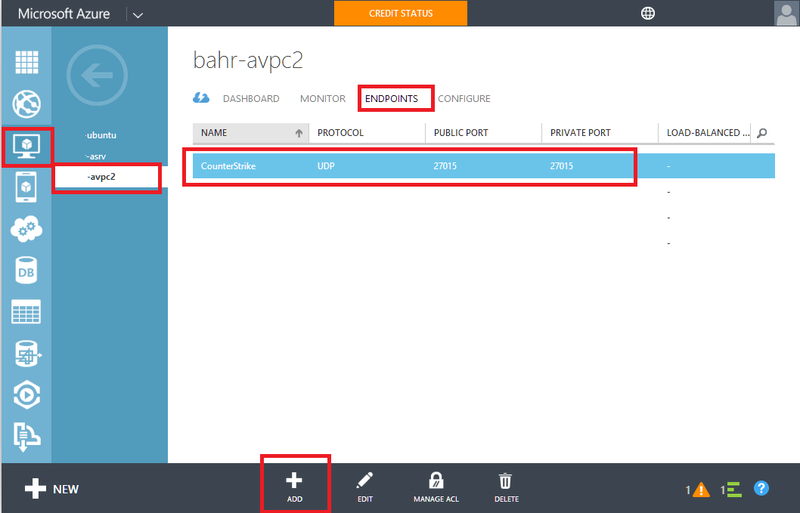 Go to Windows Azure Portal and create Endpoint for this UDP Port. 9. This is all you need to create. Go to Client PC choose Add Server and put public IP adress:27015 of you Windows Azure Machine or VMName.cloudapp.net:27015. 10. Invite your friends to play the Game by providing them with the IP and the UDP Port.